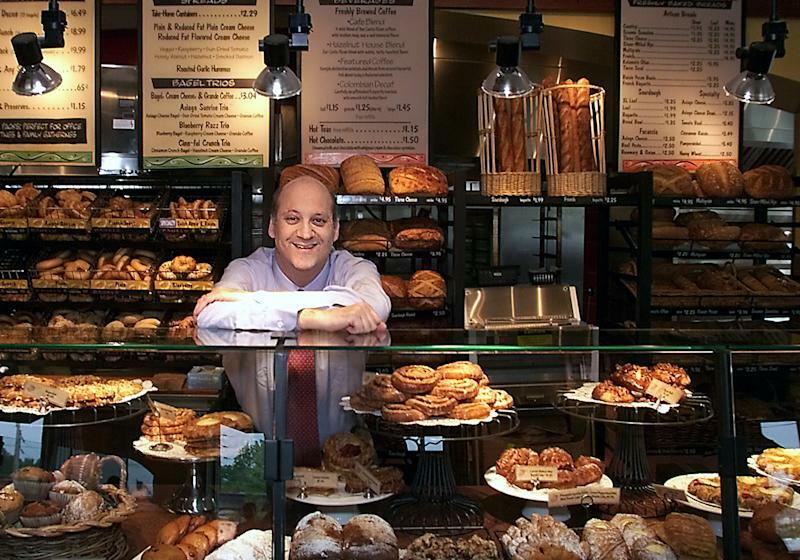 NEW YORK (AP) -- Panera CEO Ron Shaich realizes that ordering at his chain can be chaotic. First, the bakery cafe's customers are given a buzzer that lets them know when their food is ready. Then they get into a "mosh pit" to fight for their food. Next they play a game he calls "Find Your Food" — collecting a sandwich in one place, drinks in another and condiments in yet another. The confusion is a problem for Panera Bread Co., which has seen its sales growth slow as customers go elsewhere. Last year, sales at established locations rose 2.3 percent, compared with a 5.7 percent increase the previous year. Now, the St. Louis-based company is planning to overhaul the way people order in a project called "Panera 2.0" The plan includes letting customers order online or with their mobile devices to have their food ready to go at a set time. Also in the works are in-store touchscreens where customers can more easily customize their sandwiches. Workers will take the food to tables as well. It's a major undertaking that has been in testing at more than a dozen locations since 2010. The first stage of the national rollout will be the "rapid pick-up" option that lets customers place mobile orders as much as five days in advance. The full rollout to the company's more than 1,700 locations will take several years. Shaich says the idea is to eliminate the obstacles customers have to overcome to fulfill their "lust" for the company's soups, sandwiches and salads. Eventually, he said the goal is to offer "personalized menus" on mobile devices based on a customer's order history. Q: How did the idea for this come about? A: As a CEO, I'm paid to figure out where the world is going, not where it is. Today's consumer wants it their way. They want it customized. We have to have the system for that. We're entering a world where so many consumers are growing up in an omni-channel world. They want it where they want it and when they want it. And the reality is we're either going to have the capability of delivering into that or we're not. We're three to five years away. You're going to pick up your iPhone and you're going to go, "Yo. Siri. I want a Bacon Turkey Bravo at Panera." Q: Tell us about how Panera 2.0 is going to work. A: Like most restaurants, Panera operates with a one-size-fits-all system. But the reality is that's not necessarily how I need it and want it. I drive my kids to school three times a week. We stop at the Panera by my office. I used to pick up the phone about seven or eight minutes out from the store and I'd call the store and I'd say, 'hey, can you take my order?' I'd always be worried that they didn't get the order right, so I made sure they read the order back. We began to think about how we change that guest experience. Why couldn't you order food on the Web, order your food in multiple ways and have the food made as you were driving to the store? Why couldn't you walk into the store, walk past the line that's always there? Walk over to a special area where your food is waiting for you? Q: How does the eat-in experience change? A: It changes the whole thing. Imagine a world where I could place my order (on a mobile device) as I sat down. And imagine a world where it actually knew what my order was. I order the same latte, two pumps, not three, of caramel. Extra foamy with skim milk. I do it 20 times a week. Why couldn't it remember that? We began to imagine a world where you could place an eat-in order from the table and have the food brought right to you. Or you could go to a kiosk and place the order. Or yet again, you could go to a register. Everybody is talking about technology in the restaurant industry. It's the new thing. But technology doesn't matter if it doesn't change the guest experience. Q: When will customers actually see all these changes? A: This will roll out to the system in the next 36 months. The first things that will come is the ability to do rapid pickup. You place the order and designate the time you want it to be picked up, walk into that cafe and have it sitting there waiting for you on a specific bookshelf. You don't have to wait for the food. That will be out within 2014. Q: Have you seen labor costs go down in the restaurants where you roll out Panera 2.0? A: This isn't about cutting labor. We're not cutting labor. There will be labor reductions at order input when (orders) go to 30 percent or more digital, which we're already running. But we're taking that labor and we're putting it into production. We're taking labor and we're using it to do things like deliver to the table. So what we're saying is, let's put labor where it puts warmth and value into your experience. Q: You talk about the "desire-friction ratio" — tell us what that's about. A: Everything comes down to desire and friction. How much do I want it, and how painful is it for me to get? Desire is: Do I want to walk across the street? Is it relevant to me? Do I crave it? The other side of it is friction. One form of friction is dollars. But another form of friction is psychic energy. It's time. It's pain. And so a lot what we're trying to do is reduce the friction while continuing to drive the desire. Q: The company is doing so much to change the way orders are placed. How is the menu going to change? A: The underlying deeper trend is a huge movement toward customization and personalization. And ultimately where this whole world of Panera 2.0 leads is to a world where we're able to deliver the experience you want. Today we operated under a one size fits all mentality — the menu board. Hey, I've got 50 items. But I've got 150 ingredients in my cafe. I can make thousands of different things. But I wait for you to customize it. I think we're going to continually enter a world of allowing us to address smaller and smaller niches (through mobile ordering), ultimately to niches of one.